Get coverage on any compatible GSM network. Reduce your monthly cell phone bill. No roaming charges while overseas. How to unlock my Grundig phone with doctorSIM? 1. Submit your unlocking request using our online form. 2. Once you receive the unlock code, insert another SIM card into your Grundig phone. 3. When prompted for the network code, type the code sent to you from doctorSIM. The International Mobile Equipment Identity (IMEI) is a unique 15-17 digit number given to every cell phone which can then be used to check information such as the device's country of origin, the manufacturer and its model number. 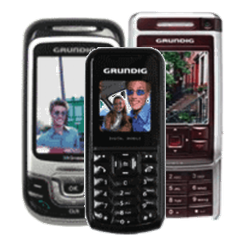 You can obtain the unique IMEI number of your Grundig by typing *#06# on the device's keypad or under settings. If you see 17 digits, just send us the first 15. Do not trust the number printed either on the back of the phone, the box or underneath the battery as it may not coincide with the actual IMEI. Why do I need a second SIM card to unlock my Grundig? One of the items you need to unlock a Grundig cell phone is a SIM card belonging to a network different to the original. Without this SIM card, the phone will not prompt for the unlock code and the unlocking will not be possible. If you have not received the SIM card of your new carrier yet or simply don't have one, we recommend borrowing one from a friend or family member as completing the unlocking process only takes a couple of minutes. Will my Grundig be permanently unlocked? Yes. Unlocking your cell phone with doctorSIM is a one-time event! You can also restore your Grundig to factory settings and download all official software updates without worrying that it will lock again to any network. Can I unlock my Grundig if under contract? Yes, you can unlock your cell phone even if you have signed a fixed-term contract with your current network but you will still have to pay your monthly bills until the contract expires. If you stop paying your monthly bills, your carrier will blacklist your Grundig phone and it won't work properly on any network in the country of origin of the original operator. How do I know for sure if my cell phone has been blacklisted? If you think your Grundig may have been reported due to theft, loss or non-payment, either ask your network carrier or use our free Grundig phone blacklist check to find out. With doctorSIM's IMEI phone check, you'll receive a comprehensive report on your cell phone in a matter of seconds including whether it has been blacklisted and if so by which network. Do your services remove cell phones from the blacklist? Unfortunately, doctorSIM's network unlocking services cannot remove a phone from the blacklist. If your Grundig is ever reported for any reason you will need to contact the network carrier that placed it on the blacklist for assistance. The simplest way to unlock your Grundig. You will be able to use your Grundig cell phone with any carrier. Cell phone unlocking experts available by e-mail or chat. Earn extra money unlocking cell phones as a distributor. Run a website? Sign up for our affiliate program.